Tastefully designed rooms for a pristine stay with a beautiful outdoor seating area. 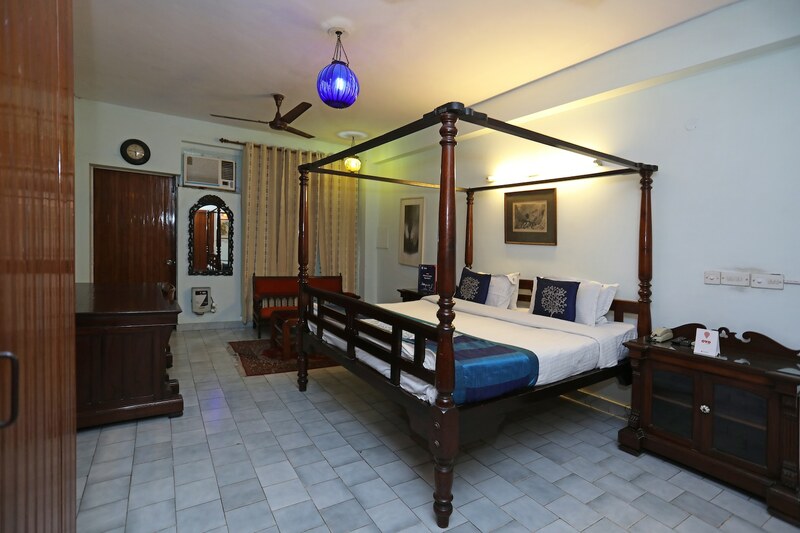 Hotel Malhar Haveli is well-decorated and beautiful property located Sector 40 of Noida. The whole place is decorated traditionally and is surrounded by greenery all around. Rooms are beautifully decorated with comfortable wooden furniture and are spacious and bright. The walls are painted in white and decorated with artistic paintings making the room look even more vibrancy. There is also a small seating space in the room. The rooms are equipped with basic and modern amenities like a mini fridge for the comfort of your stay. Guests can stay connected to their social media accounts or can complete their pending work with the availability of free Wi-Fi service in the hotel. Parking facility is also offered here for your convenience. Crazy Noodles, Chefs Bar-Be-Que, More than Cafe, 2 Bros Kitchen and Defence Bakery are some of the eateries located at a short distance from the hotel for you to enjoy tasty treats.